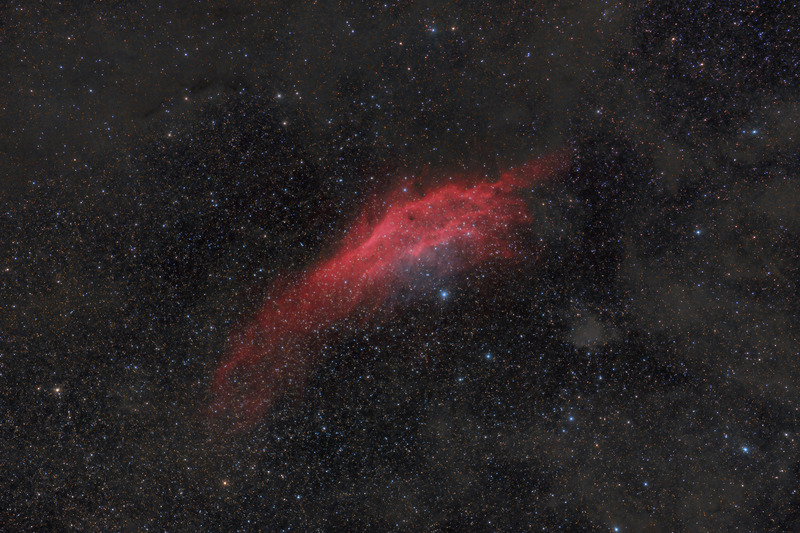 The California Nebula, NGC 1499, is a large HII nebula lying in the constellation of Perseus. The nebula is illuminated by the star, Xi Persei (the bright star just below the main nebula). Although most HII nebulae are illuminated by stars that have formed from within the nebula, Xi Persei did not originate from NGC 1499. Rather, Xi Persei is believed to be a star that was ejected from some other grouping and has "collided" with NGC 1499. These types of stars are known as "runaway" stars. NGC 1499 is located about 1500 light years away from us in the same Orion arm of the Milky Way that contains our Solar System. The nebula itself is about 100 light years long and covers approximately 4 degrees by 1 degree in the sky (about 8 Full Moons by 2 Full Moons). This image has a field of view a little over 9 degrees by 6 degrees and shows some of the faintest outer parts of the nebula as well as some of the surrounding dusty regions. In this image, North is up. This image is cropped to 87% of the original full frame. Software Used Images Plus 5.75 for camera control, calibration, stacking, digital development, horizontal banding suppression, and multiresolution sharpening. Images Plus 6.5 for arcsinh stretching, feature mask, star size and halo reduction, smoothing and noise reduction, and line suppression. Photoshop CS5 used for levels and curves, high pass filter, screen mask invert, lab color, saturation adjustments, selective color, match color and unsharp mask. Gradient Xterminator for gradient removal. Carboni Tools for additional noise reduction and smoothing. HLVG for additional color correction. Registar for stack alignment and registration. Pixinsight 1.8 for automatic background extraction, background neutralization, color calibration, star mask generation, and morphological transformation. Notes I'm pretty happy with this image, as it shows a less than common view of the California Nebula. First, the field of view in this image is much wider than typical images, so it shows the very extended Ha regions as well as some beautiful dust in this part of the sky. Additionally, while there are many Ha images of NGC 1499, there are far fewer that include the OIII data. As such, this image reveals the subtle blue/green glow in the "Lake Tahoe" part of the California Nebula. Although its certainly not the most obvious feature in the nebula, I like the contrasting color it adds to the image. This image was published by Astronomy Magazine as its Picture of the Day for July 31, 2017!